CC3: The most epic Pacific Rim-meets-Strictly Ballroom movie concept ever! Jessica leaves us hanging with the conclusion to her amazing story as she is away this week. Thankfully we have Teddy, our special guest co-host to help fill the void. 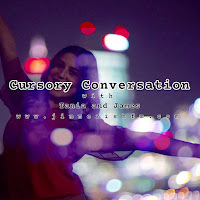 Recorded in Kings Park overlooking Perth City, Teddy shares what she has been consuming and James pitches his Pacific Rim-meets-Strictly Ballroom movie idea.